Brunsbüttel (about two and a half hours’ drive in a north-easterly direction from Bremerhaven) is situated on the River Elbe. For some time now, work has been carried on new lock infrastructure there. 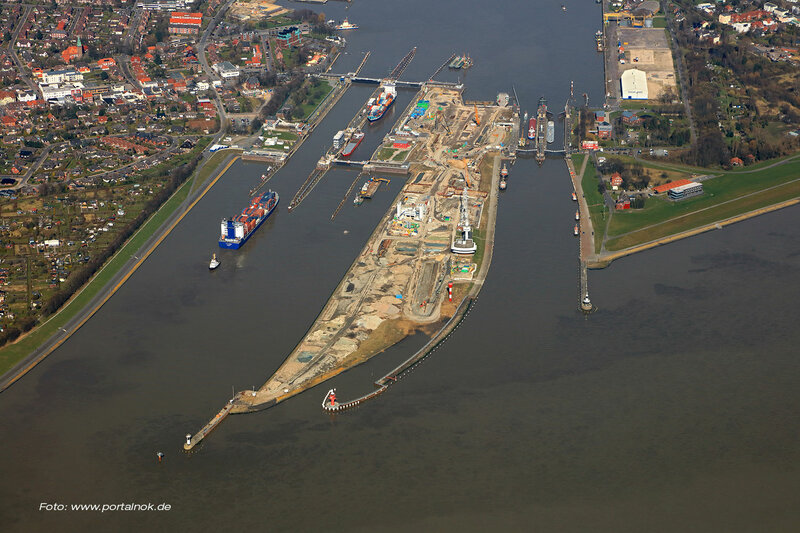 The construction of a 360-metre-long fifth lock at the entrance to the Kiel Canal on the Elbe is essential for the renovation of the 100-year-old complex of locks and to increase capacity. The entrance to the lock approach on the Elbe side is also being modified. Around 120 vessels a day negotiate these locks. As part of this large-scale project, Sterk had the task of installing sheet-piling for temporary flood protection. To do this, the section closest to the old lock head was installed by silent piling using the ‘press-in’ technique. This concerned 40 metres or so of sheet piling of the type AZ38-700, in lengths of 16 metres. The other 80 metres of piling, of type ZZ17-700, was applied with the KH-125 using a vibration method. Steel tie rods were also put in place adjacent to the construction road being built. The section connecting the old lock head was installed using Larssen 604 sections, welded at right angles, which were pressed into place and later injected. One challenging aspect of the operation was the logistics. The new location is situated between the two older locks and, as such, can only be accessed by ferry (specially purchased for this project by the construction consortium). The cranes had to be likewise transported to the site using the ferry. From there it was possible to work from land. The work was commissioned by ARGE Neubau 5. Schleusenkammer Brunsbüttel comprising BAM and Wayss & Freytag, a German subsidiary of BAM.